Welcome to Chartley Lodge site. Hopefully you will find this website a good source of information related to Charley Lodge and Freemasonry. Freemasonry is one of the world’s oldest secular fraternal societies. The United Grand Lodge of England administers all Lodges of Freemasons in England and Wales, and in many places overseas. Freemasonry is a society of men concerned with moral and spiritual values. Its members are taught its precepts by a series of ritual dramas, which follow ancient forms and use stonemasons’ customs and tools as allegorical guides. Freemasonry is not a religion, nor is it a substitute for religion. Its essential qualification opens it up to men of many religions; and it expects them to follow their own faith. It does not allow discussion of religion at any of its meetings. English Freemasonry has no political affiliations, and, as with religious beliefs, no discussions relating to political matters are allowed in its Lodges. Freemasonry demands from its members a respect for the law of the country in which a man works and lives. Its principles do not in any way conflict with its members’ duties as citizens, but should strengthen them in fulfilling their private and public responsibilities. The use by a Freemason of his membership to promote his own or anyone else’s business, professional or personal interests is condemned, and is contrary to the conditions on which he sought admission to Freemasonry. His duty as a citizen must always prevail over any obligation to other Freemasons, and any attempt to shield a Freemason who has acted dishonourably or unlawfully is contrary to this prime duty. Freemasonry is practised under many independent Grand Lodges with standards similar to those set by the United Grand Lodge of England. 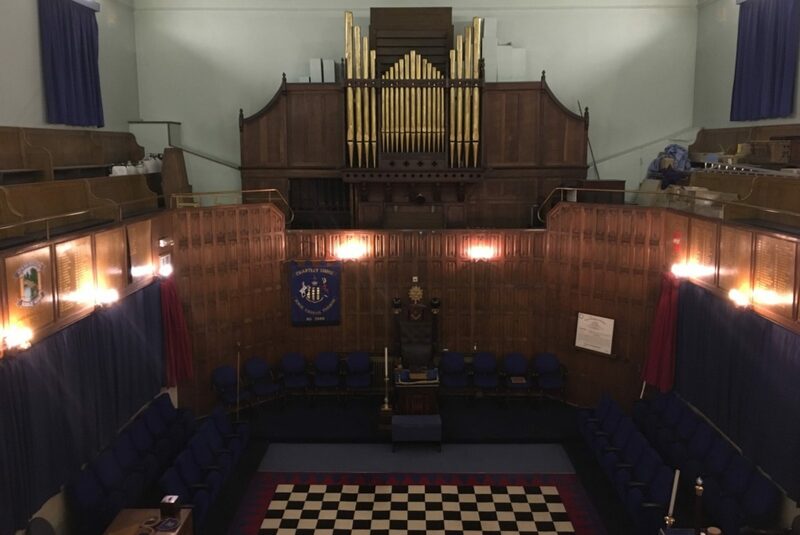 There are some Grand Lodges and other apparently Masonic bodies which do not match up to these standards: for example, they do not require a belief in a Supreme Being, or they allow or encourage their members to participate in political matters. These Grand Lodges or bodies are not recognised by the United Grand Lodge of England as being Masonically regular, and Masonic contact with them is forbidden. The essential qualification for admission into Freemasonry, and continuing membership, is a belief in a Supreme Being. Membership is open to men of any race or religion who can fulfil this essential qualification and are of good repute. What Sort Of Men Become Freemasons? Freemasons believe that a man has a responsibility to act with honour in everything that he does. Freemasons believe in God – a Supreme Being. Freemasons allow others the same right to their beliefs that they expect themselves. Freemasons have a responsibility to leave the world a better place than they found it. Freemasons believe not only that it is not only more blessed to give than to receive, but that it is also more fun. Freemasons help their Brothers when they need it, and are willing to accept their help when they need it themselves. Freemasons believe that there is more to life than financial success. Freemasons strive to be good citizens, with a moral duty to be true to the country in which they live?. Freemasons show compassion to others, believing that goodness of heart is among the most important of human values. Freemasons strive to live a brotherly life. If these ideals strike a chord with you, you would find like-minded brothers in a Lodge. Freemasons are men like you. The members of Chartley Lodge are always ready to welcome new members or visitors. They have committed themselves to enjoying their membership and the opportunities it brings for fellowship with their brethren and their families. This requires time, but it should never be allowed to come between Freemasons and their families and friends. Attend our regular Meetings, which are held eight times each year, on the first Friday in every month from October to May. Dine with the Brethren after each meeting. Attend the Lodge of Instruction – an opportunity to practise the work done in Lodge, and to meet other members on a relatively informal basis. Join our regular giving to charity, often gift aided. Meet brethren from other Lodges, and invite them as visitors to the meetings of our Lodge. There are also costs, but it is most important that Freemasons believe that a man should be able to afford membership without embarrassment to his family responsibilities. These costs include a joining fee and yearly subscriptions.